James Lee is leading efforts to advance teaching and learning through novel pedagogical approaches such as blended and flipped classroom formats. In support of these efforts, Lee and Cameron Campbell each offer a MOOC at Coursera. 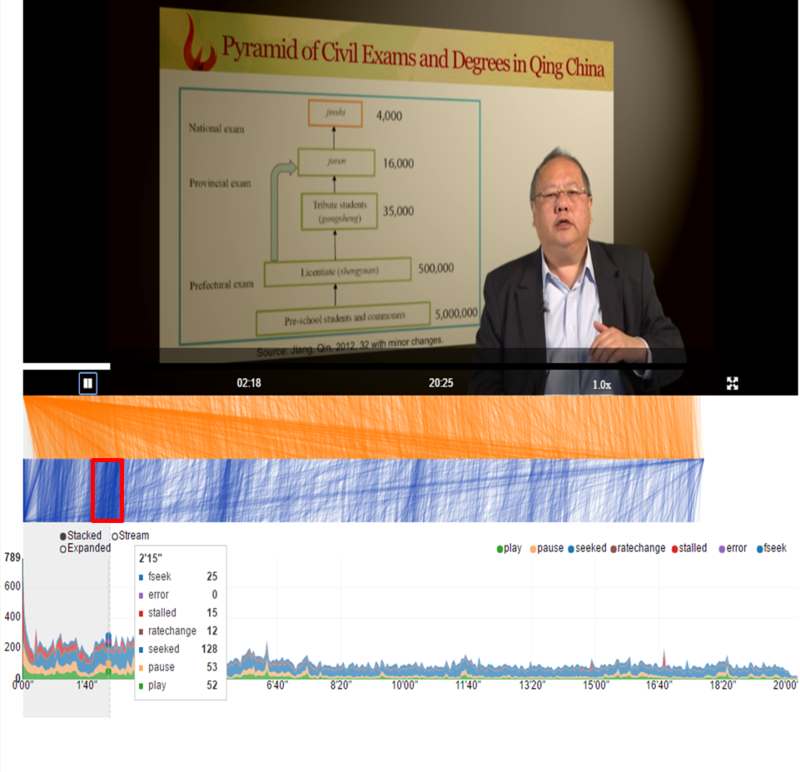 James Lee’s class, Understanding China, 1700-2000: A Data Analytic Approach, Part 1 has been offered by Coursera beginning 2013. Part 2, has been on offer at Coursera since 2015. A number of Lee-Campbell group alumni including Hao Dong, Byungho Lee, Xiangning Li, and Yunzhu Ren also made important contributions to this course. Campbell’s course Social Science Approaches to the Study of Chinese Society was launched in Spring 2017. Furthermore, as Dean of the School of Humanities and Social Science, Lee has led efforts to build an entire curriculum of online courses taught by School faculty, and collaborated with colleagues in Computer Science to use visualization tools and other analytics to assess student progress and curriculum effective. Below, we introduce Lee’s and Campbell’s courses, and Lee’s other activities related to on-line curriculum development, and innovations in blended and flipped classroom formats. Part One of Cameron Campbell’s course Social Science Approaches to the Study of Chinese Society seeks to turn learners into informed consumers of social science research. It introduces concepts, standards, and principles of social science research to the interested non-expert. Learners who complete the course will be able to assess evidence and critically evaluate claims about important social phenomena. It reviews the origins and development of social science, describes the process of discovery in contemporary social science research, and explains how contemporary social science differs from apparently related fields. It describes the goals, basic paradigms, and methodologies of the major social science disciplines. It offers an overview of the major questions that are the focus of much contemporary social science research, overall and for China. Special emphasis is given to explaining the challenges that social scientists face in drawing conclusions about cause and effect from their studies, and offers an overview of the approaches that are used to overcome these challenges. Explanation is non-technical and does not involve mathematics. Statistics and quantitative methods are not covered. Similar to the above course, Professor Cameron Campbell plans to use video recorded for the course for asynchronous self-guided learning whereby students will be assigned to watch videos that introduce basic material that changes little from year to year. The overall goal is to move away from a lecture format in which the students act as passive receptacles for information, to one that emphasizes active learning, in which students relate the basic content from the videos to real world examples. Lee has been innovating in teaching and learning, with an emphasis on development of approaches fo for flipped and blended classroom formats, and collaboration on the use of data analytics to assess student interest and progress, and provide feedback for course revision. Professor James Z. Lee has taught Understanding China, 1700-2000: A Data Analytic Approach, Parts 1 and Part 2 seven or more times in a flipped classroom format to a mixture of local, mainland, and international, beginning UG, advanced UG, and beginning PG students. This class is divided between asynchronous self-paced video viewing and inquiry-based face-to-face sessions which are oriented to reflective and soft-skill learning through teamwork. The optimal class size is between 24-36 students but can be easily scaled-up if parallel sessions are offered. Lee, working with students and support staff, has developed detailed course materials for course participants, and for shadow teachers from a variety of mainland universities and local educational institutions. Working with tools such as VisMOOC developed by colleagues in Computer Science, Lee uses data analytics including visualization to assess class reach, student progress and engagement. Below are examples of the outputs from these visualization tools. VisMOOC allows instructors to visualize real-time clickstream data on student engagement in online courses, identifying portions of a video that are repeated, skipped over, or associated with termination. This provides valuable feedback for revising courses by identifying parts that are problematic. Visualization tools developed by colleagues in Computer Science allow Lee to examine patterns of student interaction in online forums, and link activity online to other outcomes.. In their blended and flipped courses, Lee and Campbell will be making use of the VisMOOC N2 feature (Social network recommendation MOOCs) will be devised to assign readings introducing current examples relevant to each topic and to discover topics that appeal most to students. For example, in a week when discussing experiments in social science, students will watch the relevant videos for a basic introduction, and then have assigned readings that have appeared in the last year or two which describe actual experiments and their results. Similarly, in a week where discussing ethical issues in social science research, in addition to watching the relevant videos, the students will read articles about recent scandals and controversies. Every lecture will begin with the instructor making brief remarks on the topic and answering questions, and then students will make presentations on the examples. 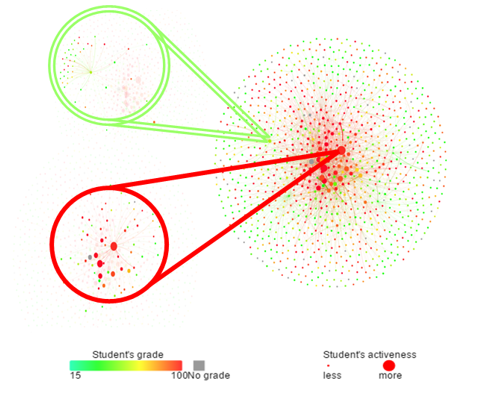 The VisMOOC E5 feature (Reasoning and Prediction of dropout) is utilized to closely monitor the academic performance of less vocal and less engaged students in order to better groom them for a transformative learning experience.